Sometimes referred to as the fifth wall, the ceiling is often the most neglected design space in the home. Cover a plain white ceiling with a decorative ceiling tile and it instantly becomes an eye-catching feature. In this blog, I’ll show you some great ways to make the ceiling a work of art. 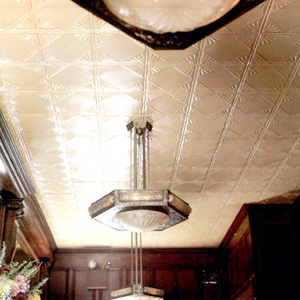 Ceiling tiles made of tin have graced businesses and homes for generations. One of the most popular restaurants in the town where I once lived in Michigan resembled an early 1900’s pub with a stunning tin ceiling. 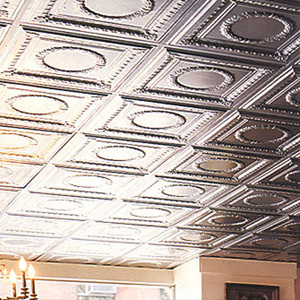 Tin ceiling tiles are still popular today as well as panels made of vinyl and other materials. Decorative pattern ceiling tins add a dramatic and vintage look to any room. Van Dyke’s offers Shanker Original Design Ceiling Tiles in an array of styles. Some of the most popular designs include squares, diamonds, circles, flowers, leaves, wreaths, and scrolls. In addition to being beautiful, decorative tiles are also used to hide ceiling marks and imperfections, and are excellent for fire retention. Ceiling tiles resist moisture and mildew and will not crack, peel or warp. also are available in classic designs and offer several advantages over tin tiles. 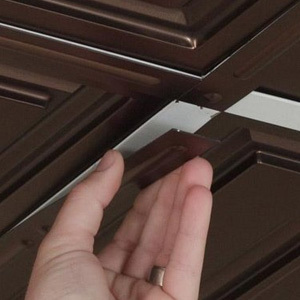 Installation requires no special tools, no special skills, and no sheet metal cuts. They will not dent or tarnish and give the appearance of pressed metal or tin plates at a fraction of the cost. They can be installed as a glue-up, nail-up, or drop-in. 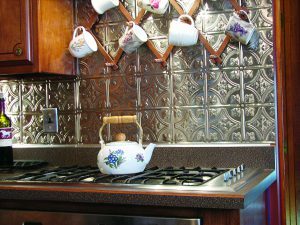 Tin or vinyl decorative tiles are also be used for decorative kitchen backsplashes. Thermoplastic backsplashes give the look of metal at a more affordable price. They are also lightweight, chemical resistant, and impact resistant.